Yes that’s right, you read that correctly, in 2019 you will be able to run VMConAWS and/or AWS native in your on premise private cloud! AWS CEO Andy Jassy (left) and VMware CEO Pat Gelsinger (right) announced this week at Amazon’s re:Invent 2018 conference in Las Vegas, that the partnership between AWS and VMware will continue to grow with the introduction of AWS Outposts. A managed service running on Amazon’s ridiculously powerful hosts currently found in the AWS public cloud, physically delivered to your datacenter, ensuring consistent hardware across your public and private clouds. Each host has dual 2.3 GHz CPUs (custom-built Intel Xeon Processor E5-2686 v4 CPU package) with 18 cores per socket (36 cores total), 512 GiB RAM, and 15.2 TB Raw NVMe storage, so some serious power. As this is a managed service, you don’t have to worry about patching, security, governance or maintenance of hardware or software. Essentially it simplifies management for customers so that they can focus on their business and it’s applications. I have servers in my datacenter now, how is this different, what’s the big deal? AWS Outposts make your public and private infrastructure consistent, giving complete compatibility and operational stability, to give you the easiest possible route to a hybrid cloud. It removes the Capex expenditure of a tech refresh and the complexity of managing the lifecycle of your infrastructure. You no longer have to concern yourself with a hardware or software compatibility matrix and can switch your expenditure entirely to Opex, so that your business can better manage and predict cost. You are basically making the tin, it’s maintenance and support, the problem of someone else so that you can focus on what the infrastructure is delivering to your business. You can also scale up and out rapidly to cope with seasonal peaks in demand both internally and externally. Leveraging VMware’s Hybrid Cloud Extension (HCX), you can easily migrate live workloads in and out of AWS. What is VMware Cloud on AWS Outposts? 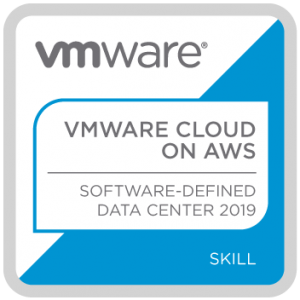 Expanding the existing partnership, from the as-a-service offering that is VMConAWS (VMware Cloud Foundation (VCF) in the AWS Public Cloud), this adds the full VMware SDDC stack running on AWS Bare Metal that is installed in your on premise datacenter. From a network perspective, this utilises the same connections that I detailed in my previous posts eg Direct Connect or VPN, to your nearest AWS Availability Zone. If your connection is lost, both will continue to run until you get the issue resolved. Similar to VMConAWS, all patching and support of VMware software is done by VMware. Can I run AWS services on AWS Outposts? You can run a large number of AWS services currently available in the Amazon Public Cloud on AWS Outposts, including VMware Cloud Foundation on an Amazon EC2 instance. You will be able to consume VCF which is pre-installed on EC2 instances and available from the EC2 cloud console. Will my staff need to re-train/re-skill? Nope, VMConAWS is built upon VMware Cloud Foundation, which uses the SDDC stack that businesses are used to. vSphere, NSX and vSAN. You manage your VMs from a vCenter interface that you’ve used for years (albeit the latest version). Knowledge from VMware training and VCPs are all still valid for this offering. There is a new VMConAWS certification which I’ll be writing about shortly, as I intend to take it with a few of my customers going big with VMConAWS.